WASHINGTON (AP) - The House Judiciary Committee is launching a sweeping new probe of President Donald Trump, his White House, his campaign and his businesses, sending document requests to 81 people linked to the president and his associates. Committee Chairman Jerrold Nadler said Monday the investigation will be focused on possible obstruction of justice, corruption and abuse of power. The aggressive, broad investigation could set the stage for an impeachment effort, although Democratic leaders have pledged to investigate all avenues and review special counsel Robert Mueller's report before trying any drastic action. 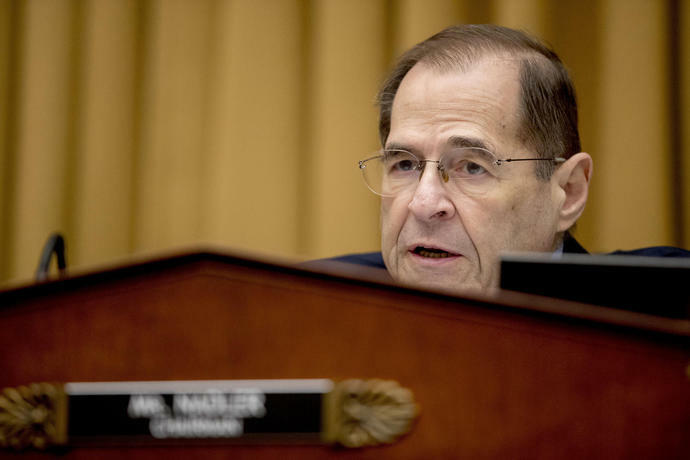 Nadler said that the document requests, with responses to most due by March 18, are a way to "begin building the public record" and that the committee has the responsibility to investigate and hold public hearings. "Over the last several years, President Trump has evaded accountability for his near-daily attacks on our basic legal, ethical, and constitutional rules and norms," Nadler said in announcing the beginning of the probe. "Investigating these threats to the rule of law is an obligation of Congress and a core function of the House Judiciary Committee." Now that Democrats hold a majority in the House, the new probe is a sign that Trump's legal and political peril is nowhere near over, even as the special counsel's Russia investigation winds down. The move all but guarantees that potentially damaging allegations will shadow Trump for months to come as Democrats try to keep them in the public eye. Nadler's announcement comes after the House intelligence panel has already announced a separate probe into Russian interference in the 2016 election and Trump's foreign financial interests. The House Oversight and Reform Committee has launched multiple investigations. Several other committees are probing related matters as well, and while many might overlap, the committee chairmen and chairwomen say they are working together on the investigations. The list of 81 names touches on all parts of Trump's life - his businesses, his campaign, the committee that oversaw the transition from campaign to the White House and the White House. There are also people connected to Russian interference in the 2016 campaign, including participants in a meeting at Trump Tower with a Russian lawyer before the election. The list includes two of the president's children, Donald Trump Jr. and Eric Trump, and many of his current and former close advisers, including Steve Bannon. It also includes his embattled charitable foundation, which he is shutting down after agreeing to a court-supervised process, and officials at the FBI and Justice Department. The committee is expected to use the information to amass information that officials can then comb through, according to a person familiar with the investigation. The person declined to be named to discuss the committee's internal process. The committee expects some people to produce right away, and others may eventually face subpoenas, the official said. It is unclear how many will eventually be called in for interviews. The announcement of the new investigation follows a bad political week for Trump. He emerged empty-handed from a high-profile summit with North Korea leader Kim Jong Un on denuclearization, and Trump's former personal attorney, Michael Cohen, in three days of congressional testimony, publicly characterized the president as a "con man" and "cheat." Nadler previewed the announcement on ABC's "This Week" on Sunday, contending it's "very clear" that Trump obstructed justice. He said House Democrats, now in the majority, are simply doing "our job to protect the rule of law" after Republicans during the first two years of Trump's term were "shielding the president from any proper accountability." In a tweet on Sunday, Trump blasted Mueller's Russia investigation, calling it a partisan probe unfairly aimed at discrediting his win in the 2016 presidential election. "I am an innocent man being persecuted by some very bad, conflicted & corrupt people in a Witch Hunt that is illegal & should never have been allowed to start - And only because I won the Election!" he wrote. House Minority Leader Kevin McCarthy, R-Calif., on Sunday accused House Democrats of prejudging Trump as part of a query based on partisan politics. "I think Congressman Nadler decided to impeach the president the day the president won the election," McCarthy said. "Listen to exactly what he said. He talks about impeachment before he even became chairman and then he says, 'you've got to persuade people to get there.' There's nothing that the president did wrong." "Show me where the president did anything to be impeached," he said. House Speaker Nancy Pelosi, D-Calif., has kept calls for impeachment at bay by insisting that Mueller first must be allowed to finish his work, and present his findings publicly - though it's unclear whether the White House will allow the full release.